(CBS/KPHO/AP) PHOENIX - An Arizona man was caught with snakes in his pants. Eric Fiegel, 22, was arrested on theft charges Tuesday after police said he stole five snakes from Predators Reptile Center in Mesa, about 20 miles outside of Phoenix, reports CBS affiliate KPHO. Police said Fiegel stuffed the snakes in his pants and then talked with people in the store before walking out. Investigators released surveillance video of the incidents. In one incident, a man can be seen stuffing a snake into his pocket, then returning less than a minute later and swiping another one. The snakes are baby sharp albino boa constrictors worth about $800 each. They are much more expensive than regular boas and other boas because their darker more colorful markings, according to the store owner Christian Kaleta. Kaleta said the man was lucky he didn't get bitten, reports the station. "They're always active," said Kaleta to KPHO. "It's amazing they stayed in the guy's pants as long as they did." Once Kaleta discovered the snakes were missing, he looked at his surveillance video and figured out what happened. He said he called local reptile stores and another store reported that a man had just sold and traded several sharp albino boas. 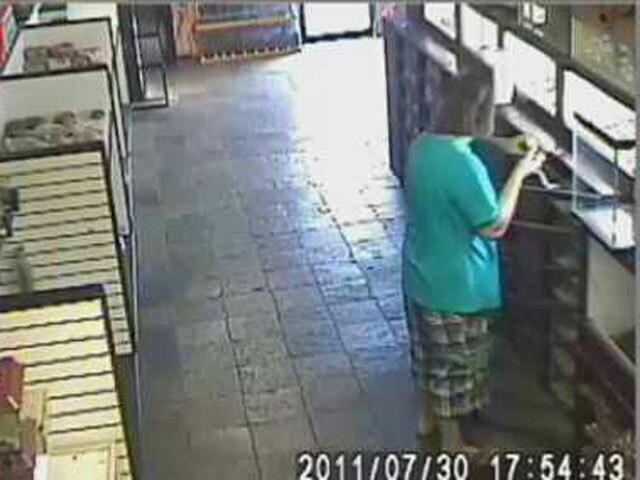 The other store, Arizona Reptile Center, returned the animals and filed a police report.